Wirquin NEO has announced the launch of a full new range of basin and sink traps which boast a zero-leak bottle trap feature. Due to bi-injection technology, all washers are over-moulded onto the body to ensure no loss of washers and giving total protection against leaks. 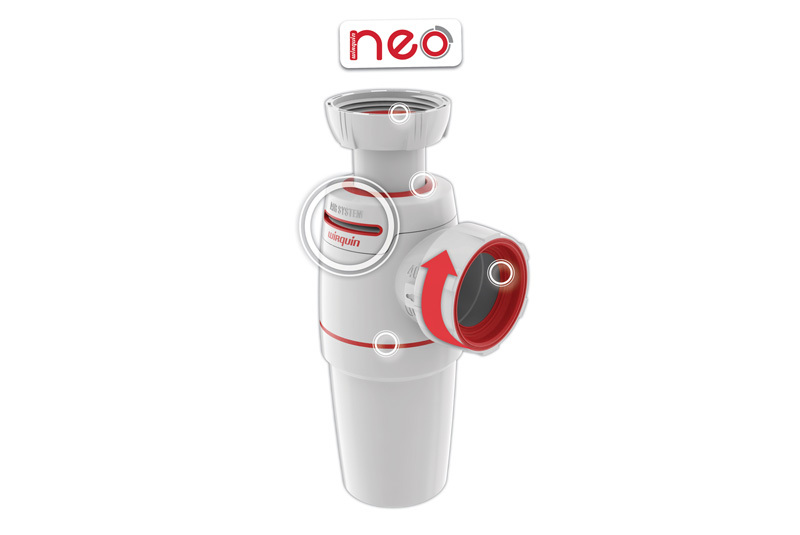 The Wirquin NEO Air system function is an option that replaces the traditional ventapipe air admittance valve, preventing noisy gurgling and bad smells. It allows the pipes to be naturally ventilated; when a negative pressure is created in the pipework, the membrane rises and creates continual ventilation to prevent the suction of the water seal. All Wirquin NEO products have been designed to be quick and easy to fit thanks to the ‘quick safe’ function, a ¼ turn captive nut that ensures a reliable installation and easy to clean with a ¼ turn base. To celebrate the introduction of the new NEO range, Wirquin are giving a free sample of the NEO by visiting www.wirquin.co.uk/freeneo.